In the game of the Matchday 3, Shakhtar faced Hoverla Uzhgorod and claimed a confident win. As expected, after the game with Fenerbahce in the Champions League, Shakhtar’s squad underwent significant changes. Anton Kanibolotskiy was stationed in goal, Oleksandr Kucher and Ivan Ordets played at the heart of defence, with Azevedo operating at left back. Maksym Malyshev and Viktor Kovalenko, who made his first appearance in the starting lineup in the league game, were fielded in the holding midfield. Bernard also took to the pitch as part of the starting eleven, and the last time Facundo Ferreyra put on Shakhtar shirt was in May 2014. As early as in the opening seconds, Ferreyra fired a powerful shot – the ball flew just wide of the goal post. Soon, it was Marlos who had a chance to score. Shakhtar totally dominated proceedings, carving the opposition defence open on all fronts of the attack. The Pitmen took the game to Hoverla’s half, who were just sitting deep without thinking about counterattacks. It was hard for Shakhtar to create goal scoring chances, considering such a game, the opposition were playing very cautiously at the back, and the visitors’ goalkeeper managed to deal with shots from Bernard and Kovalenko from outside the penalty area. The first half ended goalless. Straight after the break, Kanibolotskyy came to rescue his team, when Gemega fired a first time shot towards the near corner. But in the following attack the Pitmen opened the scoring. Alex Teixeira beat his marker at the edge of the penalty area before curling a right-footed shot into the top corner of the net to make it 1-0! Teixeira scored his fifth goal in the top scores’ race, and taking into the account the past season, the Brazilian equaled Andriy Vorobey’s club record, scoring in seven games in a row. Soon Kanibolotskyy was again in the spotlight, as he threw himself at the opponent’s feet during a cross to the near post – our goalkeeper even needed a medical help. But Shakhtar created far more dangerous chances, and the Pitmen were still dominating proceedings. Gladkyy, who came on as a sub, could have scored twice, and on 74 minutes, a goal was scored by another player who came on as a sub – Eduardo, who expertly took a shot from the edge of the penalty area and into the bottom corner of the net after a pass from Taison – 2-0. Eduardo netted a goal in his second game in a row. The Pitmen could have extended their lead, but Hoverla’s goalkeeper managed to cope with all the shots from Shakhtar’s players. The Pitmen’s defender Ivan Ordets has been named the Man of the Match. 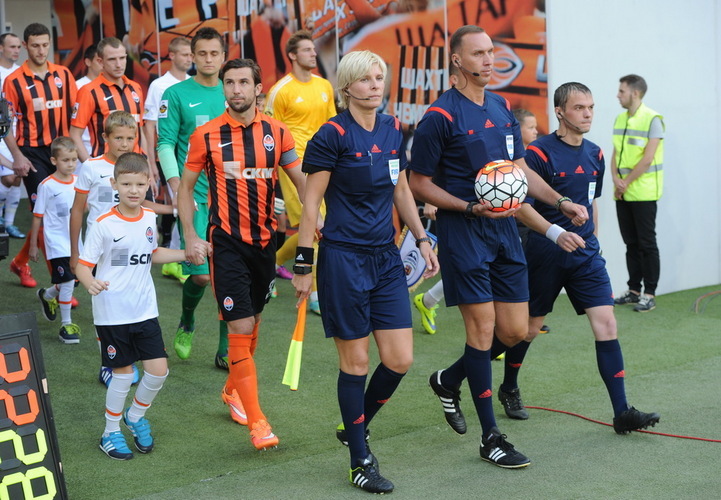 As a result – 2-0, Shakhtar claimed their third win in the current league campaign and continue topping the standings.